When I was pregnant with my first child this was the biggest scariest question I had. 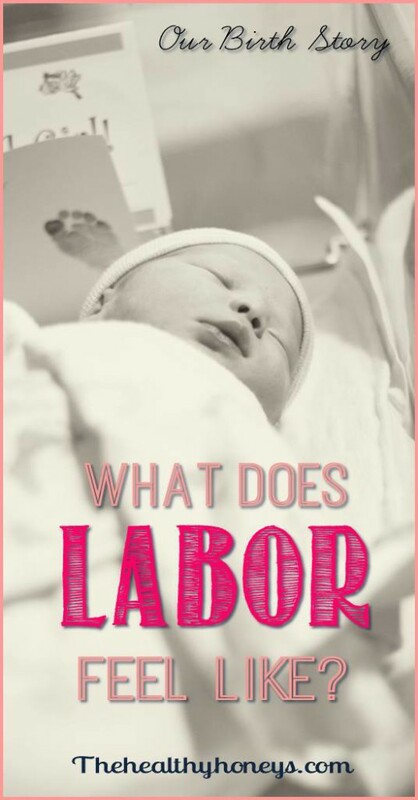 What does labor feel like? How much is natural labor going to hurt? I read a lot of books…Childbirth Without Fear was one that actually did answer a lot of questions and did a good job at explaining what it does feel like. I want to tell my birth story but go into some of the details that I always question. 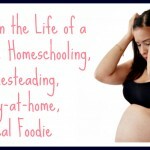 Natural labor feels very different through each stage. I was anxious because my first was a premie so I really wanted to carry my second full term. At 34 weeks I started having some contractions. They really weren’t painful at all. My uterus would tighten and it felt like a flexing muscle. They made me nervous though because 34 weeks is still too early for a baby to come. As I neared 40 weeks I started thinking differently. I was ready to have this baby. I progressively had more and more contractions the closer I got to 40 weeks. At 39 1/2 weeks I would have bouts of contractions that varied from 5 minutes apart to 30 or 40 minutes and would last 2-3 hours. Some of these contractions were just muscle flexing… others actually hurt like period cramps. My contractions usually hurt in my lower back. I was anxious to get this labor started, so I tried encouraging it by going on walks and things. Though I didn’t get my hopes up just yet. Remembering labor from my first… when I went into labor they were consistent and painful enough that I couldn’t sleep through them. When I actually went into labor it was 12:30 the morning of my due date. I woke up to a pretty painful contraction. So what is painful. The pain starts slowly and works up in intensity until it peaks and gradually comes back down. You could compare it to period cramps but at the peak of intensity it is definitely worse that any cramps I’ve experienced. My contractions started at 3-5 minutes apart. I had downloaded an app to count them but by the intensity of the pain I knew this was the real thing. I got ready, got showered, and took my toddler to see grandma and grandpa (poor little guy was super sick). I labored at home till 3 and then took off to the hospital. We got there at 3:30 am. Laboring in a vehicle is not fun by the way. I knealed in between the seats so I could lean forward and get some of the pressure off my back. By the time we got to the hospital and got checked in I was dialated to a 5. They had me lay on the bed to do 15 minutes of monitoring then let me get up and move around as I wanted to. One thing that helped a lot with my first was pressure on my knees and lower back. It didn’t seem to provide as much relief this time but it did provide enough. Whenever I would have a contraction I found that getting down on my hands and knees was the best way to deal with it. My husband would push down on my lower back opening up my pelvis. This decreased the pain. In most hospitals they don’t recommend eating or drinking but I was parched. I stole some of my hubbies apple juice and it wasn’t two minutes and I threw it up. I don’t know where the recommendation came from but for me I can’t hold anything down during labor… except for sips from my ice chips. I decided I wanted to use the jetted tub available at the hospital and asked them to fill it up. We monitored for another 15 minutes before I went to the tub…. As I left my room however I dropped to my hands and knees again. The contractions were getting more painful. I couldn’t get up for a minute and I felt like I’d lost control of my breathing because of the pain. I went back to my room and was check again. I was at an 8. It was time to call the doctor in. The doctor came in. I was able to labor partially sitting up. With each contraction my husband and a nurse would push my legs up to create the pressure to help ease the pain. By this time I had forgotten what I had learned…. to breathe through the contractions. I would grab the side of the bed and flex up really bad. My doctor, was very good at coaching however. He reminded me to breathe through the contractions and that helped immensely. As I dilated and effaced completely I was told it was time to push. Ironically I found this difficult. I could feel everything. Each time I had a contraction…which by now felt pretty constant. As soon as one would stop another would start. The baby was crowning. They coached me to hold my breath and push…(pushing…means to flex the muscle you would usually flex when you poop. ) yep that’s right pushing a baby out feels like trying to push a really difficult poop out. I wasn’t quite getting it until my dr. pushed against the muscle and told me to flex there. I did a really hard push as instructed and felt the baby pushing spreading open my perineal area. So I stopped pushing for a minute and tried again. I reached down to feel the baby but when I wasn’t pushing she would go back up inside. So I pushed again this time pushing past the pain caused by stretching… which felt more or less like and indian burn (you know when you hold your skin with both hands and twist opposite directions.). The head came out… Now this is the most akward feeling ever. The head is out but not the body. I started pushing again right away and the rest of my little girl was born. 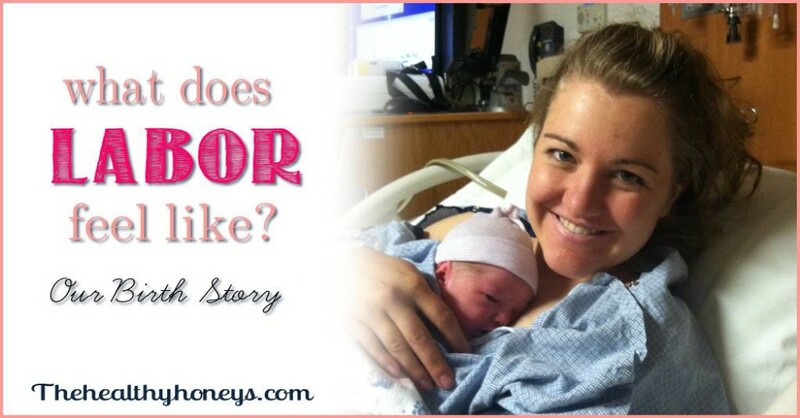 As soon as she came out my contractions stopped and I felt a rush of relief. Yay. I was done! The look on my husbands face was the best. He looked at me at told me I was amazing! He was so excited! I was so relieved! They handed me my sweet little girl. Honestly now I don’t remember if she started nursing right away or if they did her cares first and then she started nursing. She was so little and fragile. We waited a couple minutes until the cord had stopped pulsing and the dr. drained the blood into her and my husband cut the cord. Then he pushed on my stomach somehow…and the placenta just came out. It’s not hard delivering the placenta it just comes out and feels like passing a ginormous blood clot. I was checked to see if I had any tears or anything. They offered pitocin to help my uterus contract but I didn’t want any. No tears by the way. I was super excited. This was going to be the best recovery ever. Initially I was taken to my room. By now I’m feeling pretty good though pretty tender as well. Everything was really swollen. They gave me an ice pack and I just chilled with my baby and husband. We were both exhausted because we had been laboring all night. We both took a nap with our little girl. After I was released from the hospital I noticed that my coccyx was really hurting. I went to a massage therapist and found out I had broken my tailbone. No idea how that happened. I didn’t even realize it until two days later. After-pains are the uterus tightening back down. These hurt almost as bad as contractions….initial labor contractions. They really aren’t horrible. But the more children you have, the worse they are. I only had after-pains while I was nursing. Nursing would cause my uterus to contract. These lasted for about 2-3 days and then were so faint I barely noticed them. From there on out it just gets better. My tailbone did hurt when sitting for too long but I bought a donut and tried to change positions alot. I’m now three weeks postpartum and am feeling basically healed up from everything… Although things are still a little tender down there. I have chosen to focus this birth story and what it actually feels like but in doing so I feel like I have left out all the wonderful emotion associated with it as well. When my labor first started I knew it would take a while and honestly was hoping for less than 8 hours. I remember thinking multiple times during this labor… “Yeah I know recovery is going to be easy but am I missing out on this whole world of epidurals?” I could just not be feeling pain…but then I remembered in order to get an epidural they have to stick a giant needle in your back. I pushed through… by the time it was time to push… when the pain is really intense I remember hearing the nurse say. “This baby will be here within the hour”. That was a beacon of hope. Only one hour and I’m done. Not to mention the loving support of my husband during the whole labor to assist me in my pain management. When the baby was born I felt so much relief and awe at what had just happened. My body had made a baby and she was finally here. I am so grateful that we had such a great labor and got our little girl here safely. Thanks so much for sharing! I’m 16 weeks pregnant and have recently started wanting to read some non-flowery and non-frightening accounts of what happens at birth! This really fit the bill! Congratulations! Loved this post. I was looking for this exact sort of account. I really appreciate you taking the time to write it out. Congratulations on your little one!